At this point, it would seem that Chevy salesman Nick gets into these awkward moments with potential buyers on purpose. 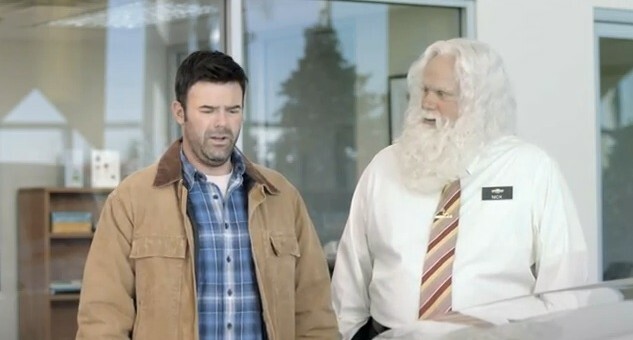 The Reindeer ad is also produced in this extended version — which takes “awkward” to a whole new level. “Saw a catfish the other day. Hunted him real good.” Need we say more? Previous story Looking For An Alternative To The OnStar RemoteLink App? Here It Is! I am opposed to hunting or the enslavement of animals as a food source for humans. Unless they are delicious. Agreed. I’d take that a step further and say that hunting is useless “unless [humans] are in dire need of food”, as in unless they’re trapped on a deserted island with nothing to eat — and thus they have to hunt. Either way, today’s “hunting” is not even hunting. If someone were to take on a deer or buffalo with their bare hands (and not a gun), that would be one thing. But shooting them through a scope from 1,000 feet away while drenched in piss and dirt for the sake of “camouflage” is not real hunting. I’d go as far as to say that in the first world, there is no such thing as “hunting”. but nobody in the first world “needs to hunt”. There was demand for hunting 100 or 200 year ago, but really there isn’t a good case for it if you ate pepperoni and drank 7-up as you drove in your air conditioned Siverado along a paved highway to a patch of land a farmer lets you pick off deer on; that’s if you find any. I’m not against hunting, I just don’t see the point of it in the first world. I think there are some aborigines in Australia that live in tribes, without technology and away from the world. They still hunt (for real).